Vicki Kraai is Owner/Founder of VK Solutions, a community bank consulting company that provides guidance to community banks to grow their people and profitability. 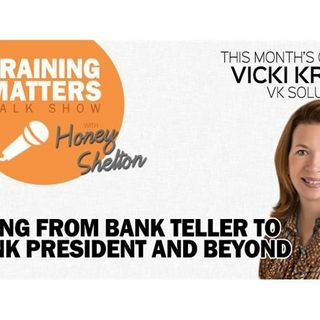 She tells Honey her story on how she went from being a bank teller, to being a bank president to running her own company in this episode of Training Matters: From Bank Teller to Bank President and Beyond. Honey and Vicki also discuss talent management and customer experience tips you can apply at your bank or credit union. Vicki has ... See More a comprehensive background in community banking and project management. She is respected as a people-oriented facilitator and leader and is able to build consensus, shape organizations and produce results. She is a customer focused strategy expert and grew up in the financial services industry from teller duties to Bank President/CEO/Owner.